19/09/18 -- Sheila has finally returned to her blogging with a post featuring two new travel films about her trip to Palawan earlier this year. Go to the Blog page to read the new post and watch the videos. 03/07/17 -- Sheila's creative non-fiction essay "Pansy" has been republished on the Humanidades Ambientales website as part of a research project. Check it out. 23/06/17 -- In honour of World Pride 2017, Sheila has shared a creative non-fiction essay she wrote a few months ago. Go to the Blog page to read "Pansy." It highlights the power that words possess, the importance of accepting one's true nature, and that differences can make us all stronger if we embrace each other with compassion. 16/06/17 -- Sheila has composed a new poem inspired by Santorini's Amoudi Bay and the steps that lead to the village of Oia. Visit the Blog page to read it. 13/02/17 -- Sheila has written a new flash fiction story. Visit the Blog page to read this thrilling crime narrative. 17/10/16 -- Sheila has created a new travel-themed short film about a recent trip in the Western Highlands of Scotland. Click here to watch it. 13/10/16 -- Sheila's second single, "Goodbye" is now online and ready for your listening pleasure. Go to the Blog page to check out this latest song from her songwriting partnership with Eugene Vishnevski. 12/01/16 -- Sheila has produced two new travel films from her recent trip to Germany and Austria. Go to the Blog page to watch them. 12/10/15 -- The hardcover edition of Sunsets in Oia will be discontinued in a matter of weeks. Sheila has opted to stop its printing for the foreseeable future, but the paperback and eBook editions will continue to be available. If you're a book collector or know someone who is, please place an order for the hardcover of Sunsets in Oia as soon as possible. FriesenPress will cease its printing on November 5, 2015. Go to the Bookstore page for the links of all available global retailers. If you're a retailer and want to place a wholesale order, please visit the Ingram Wholesale website and search the ISBN: 978-1-4602-2985-9. 23/08/15 -- Last night, Sheila had the pleasure of attending Andrea Bocelli's sold-out concert at the Starlite Festival in Marbella, Spain. Click here to read her account and review of the show. 01/06/15 -- Sheila has partnered with Belarusian musician Eugene Vishnevski to write lyrics for some of his new songs. The first one is now available online. Go to the Blog page to read the lyrics Sheila wrote for "Hollow Heart" and listen to the track. 15/02/15 -- Sheila will be one of the plenary speakers at an upcoming conference in Morocco. Click here for more details. 21/01/15 -- Sheila has written her first flash fiction story and published it on her Blog. Titled "The Funeral," it was written for a writing workshop she is currently teaching in Morocco. She plans to write more flash fiction stories in the future, so check back frequently for updates. 23/10/14 -- Sunsets in Oia will turn 1 year old on November 5. To celebrate, Sheila has launched a Goodreads Book Giveaway Contest. Visit the Blog page for all of the details. 27/09/14 -- Sheila is currently visiting Oia for the third time, doing research for her second novel. She took time to meet with Evangelos Konstantinidis, the owner of Books & Style in Fira. For those visiting Santorini, you can now take a piece of the island's romance home with you by picking up a copy of Sunsets in Oia at this awesome bookshop. Thanks for the support, Books & Style. 26/07/14 -- Sheila has created a short film about life in South Korea and entered it in a contest hosted by the Ministry of Foreign Affairs. Head to the Blog page to watch her creation. 03/07/14 -- Sheila can now add "film director" to her list of accomplishments. Head to the Blog page to see her first short film about a recent sailing experience in Busan. 17/06/14 -- Sheila has just done an interview with Sri Lankan writer Devika Fernando. Click here to check out the Q&A article about Sheila and Sunsets in Oia. Also, visit the Press/Media page to see other articles about the book. Thank you, Devika! 10/06/14 -- Sunsets in Oia has received a 5-star review on Amazon and Goodreads from Indian reviewer and blogger Aditi Saha. Click here to read the review and order your copy of the book. Thanks so much, Aditi! 28/05/14 -- Sheila has just done her first interview with a blogger in India. Sunsets in Oia is getting around! Click here to check out the article, and visit the Press/Media page to see other articles about the book. Thanks so much, Jaideep! 26/05/14 -- The first Sunsets in Oia Goodreads Book Giveaway is on now! Head to my Blog page for all of the details. 06/04/14 -- Thank you to Michael Brookes for putting together an awesome author interview on your The Cult of Me blog. Click here to read the story. 01/04/14 -- Thank you to Maria A. Karamitsos for reviewing Sunsets in Oia for The Greek Star. Click here to read the review. 11/03/14 -- The 1st Annual Birthday Book Giveaway Contest has begun. Go to my Blog page for all of the details. 02/03/14 -- Thank you so much to Bill England and the staff of my hometown newspaper Tecumseh Shoreline Week for running a cover story about me and Sunsets in Oia. Click here to view the PDF copy of the article. 26/02/14 -- While proctoring vocabulary tests today, I had a creative breakthrough: I envisioned a concept for my next novel. All I'll say now is it'll take me back to Santorini and also back in time. The research has begun -- this is gonna be intense, people! 21/02/14 -- The second article in my Author Interview Series is now online. Head to my Blog page to read about Ellen Whyte's experiences as a self-published romance writer. 09/02/14 -- Thank you to interviewer Christy Campbell and You Read It Here First founder Christina Hamlett for posting an awesome article about Sunsets in Oia on your website. Click here to read it. 18/01/14 -- The first article in my Author Interview Series can now be read on my Blog page. Go there now to learn about Wendy Joseph and her fantasy novel The Witch's Hand. 03/01/14 -- Thank you to Judy Goodwin for posting an awesome interview with me on your blog. 06/12/13 -- Sunsets in Oia is now available for Kobo eReaders at the great price of $2.99, so click here to download your copy now. 06/12/13 -- I'm going to pay it forward by using my blog to promote other promising self-published authors. Head to my Blog page to learn more about my Author Interview Series. The first article will be posted soon. 17/11/13 -- Sunsets in Oia is currently No.2 on the FriesenPress Best Sellers List. This is awesome! Let's keep this up and soon it'll be No.1! Click here to order your copy now. 14/11/13 -- Thank you to the Greek Reporter for running an article about my book. View the story here. Sunsets in Oia is now available through Amazon, Chapters Indigo and Barnes & Noble. 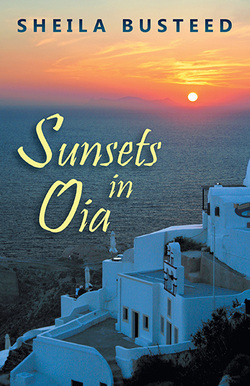 Also, the eBook PDF version of Sunsets in Oia is now for sale through eBookPie and Lybrary. More retailers will come online soon. Check back for more updates. 08/11/13 -- Sunsets in Oia is officially for sale starting today! Click here to order your copy from the FriesenPress online bookstore. Links to other retailers will be added to the Bookstore page on this site soon. 02/11/13 -- Sheila marked the upcoming release of Sunsets in Oia with a party in Busan at LOL Guesthouse, which is owned by her friend Youngjoon Lee. The event was attended by about 30 of Sheila's friends, and featured a reading from the novel as well as a Mediterranean-style spread of gourmet appetizers. Selene Doherty's excitement from the successful tour with her band is cut short when she learns that her parents were killed in the Athens riots. After the funeral, she escapes to her bequeathed summer home on the island of Santorini to recover from the tragedy. She is haunted. The loss of her family leaves her with a feeling of disconnectedness that is unshakable. But a chance reunion with a man from her past brings new romance - and hope. Drawing strength as he helps her get in touch with her roots, she begins the journey to redefine her life.